RESCOLL and 3NTR make possible FFF 3D printing of high temperature polymers and composites in the frame of the Clean Sky SPECTRAL project. FFF (Fused Filament Fabrication) 3D printing of technical parts with high-performance engineering polymers (such as PEEK, PEKK, PEAK…) is now possible at affordable prices! FFF has long been considered as a process for non-technical activities. However, this technology offers a significant technical and financial advantages, and has recently garnered renewed interest for industrial application by several major companies. In the next 3 years it is expected that the 3D printing landscape will move in favor of the FFF market. Polymers of the family of “high-performance engineering polymers” are frequently used for applications demanding high mechanical resistance among other very technical requirements in applications such as aeronautics, space and medical. However, the high melting point, deformation when cooling, management of crystallinity, and other technical issues inherent to the printing process of these polymers have limited their development technical applications. Manufacturers of FFF 3D printers are mostly focused on a B2C model (Business to Client), and very few are focused on a B2B (Business to Business) model, taking the real challenge of developing technical equipment with an industrial approach of precision and robustness. However, FFF printing technologies offer a very wide spectrum of possibilities in terms of polymers, the possibility to modify them with added functionality such as electrical or thermal conductivity, fire resistance, or osteoconductivity. In the last 2 years printer manufacturers have moved from a surface morphology of 50 to 20 microns, from open printing chambers to closed ones having sophisticated thermal management systems, and several new programming features. 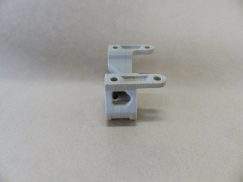 The development of equipment is not stopping here, as several other actions are ongoing, such as an increase in the capacity of printing very big parts, printing over existing pieces, and simplifying the material feeding systems. Finally the printing process is also important. Improper thermal management, printing speed, material throughput, and support design can lead to delamination of successive shells of polymers due to bad interfaces and/or differential shrinking phenomena, deformation of the final pieces and several other undesired phenomena. The European consortium of the SPECTRAL project, funded under the framework of the Clean Sky 2 initiative (contract 737845), has successfully printed its first pieces using PEEK. The consortium is led by RESCOLL (materials development), and includes 3NTR (printer development), and AIRBUS (Topic Manager). The SPECTRAL project is developing a new generation of high-performance printers specifically for high-temperature, difficult-to-print engineering plastics, and was able to print its first PEEK pieces thank to the new features of the SPECTRAL printers. The consortium expects to bring to the market a new printer technology with the associated materials during 2018. The equipment, the materials and the process will be compliant with the demanding quality standards of the aerospace industry. Several demonstrators having different challenges and corresponding to real life industrial parts will be printed successively to evaluate and overcome to the different complexities of the technology.